n Two separate stacks of two-story classrooms (one built to the north, the other to the south of the school) are planned. n A new commons area. n New school administrative offices. n A new courtyard and a new auxiliary gymnasium. 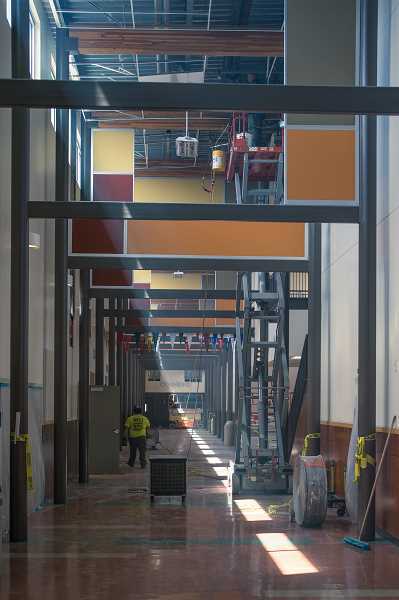 "This is probably our biggest and most complicated project this summer," said Tigard-Tualatin School District Spokeswoman Susan Stark Haydon, noting that the logistics of continuing construction while 2,000 students are attending classes is complicated. Construction on the project began in June the day after school was out. "The school moves out toward Durham and … squares up to it," said Kurt Schwabauer, a superintendent with LCG Pence, the construction firm in charge of the construction and remodeling. Schwabauer noted that previously the school was at a skewed angle to the street. Construction plans call for both the new north set of classrooms and the new administration offices to be pushed closer to Durham Road once all the construction is completed by the beginning of school in the fall of 2019. 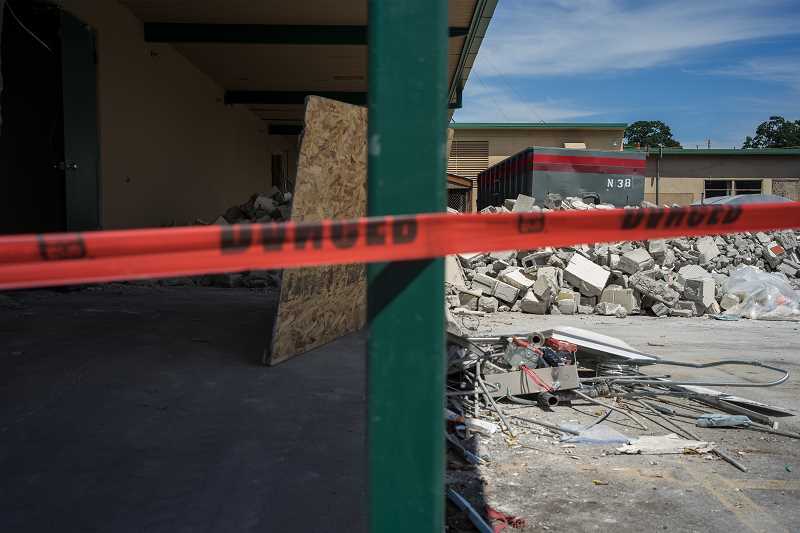 Earlier this summer, art classrooms were demolished with plans to distribute those classrooms throughout the school for the time-being. Major improvements will be made to the main school offices and the school's entry, designed in large part to address security issues by making the new entrance more visible and safe. The stack of two-story classrooms at the south end of the school will be completed by the fall of 2019. "So there will be a net gain in classrooms because we have kids in portables now," Stark Haydon said. The last remodel of the school occurred in 2004 on the east side of the school, which was originally constructed in 1953. New bus lanes are expected as well, Schwabauer said. Still, one of the more significant changes staff and students alike will experience in the fall involves parking. Both of the main student parking lots along Durham Road will be completely shut off except for a handful of spaces in front of the auxiliary gymnasium. That means that while there will be some parking available in space currently occupied by the lower tennis courts, an additional temporary gravel parking lot will be constructed on the grass athletic fields east of the aquatic center. Brooke De Freval, a project coordinator with Day CPM, said there should be an equal number of parking spots set aside in the temporary parking as there were in the other lots before the tear-down. "It should help," Schwabauer said. "It will keep kids out of the neighborhood." Schwabauer said construction of the two-story classroom wing to the north will likely begin in the spring. "The great thing about Pence, they've already done this five times," Stark Haydon said about the company that has completed or is currently remodeling such schools as Silverton and Reynolds high schools. She noted that the new construction will not touch the 2005 addition of classrooms and what became the school's new library. While current administration offices will remain intact this school year, everything else that butts up to those structures has been torn down, including the school's commons area. With the commons gone in the fall, students will have to use the cafeteria to eat and socialize most likely until 2020, when the expanded commons area is opened. "Once the new commons opens, the cafeteria will be repurposed," Stark Haydon said. "Current plans call creating a black box theater in part of it — and possibly using the current cafeteria kitchen as part of a new culinary arts program." At the same time, the main gymnasium will remain intact but crews will take down and rebuild the auxiliary gymnasium over the next two years. 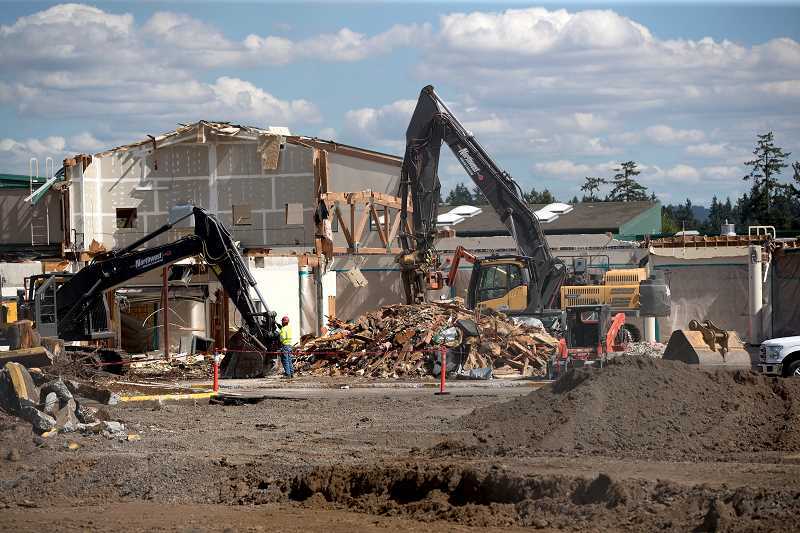 Meanwhile, plans are underway for major construction projects at Tualatin High school. Those will include expanding the commons area, moving the office to the center of the school, adding a classroom wing and expanding the technology wing.